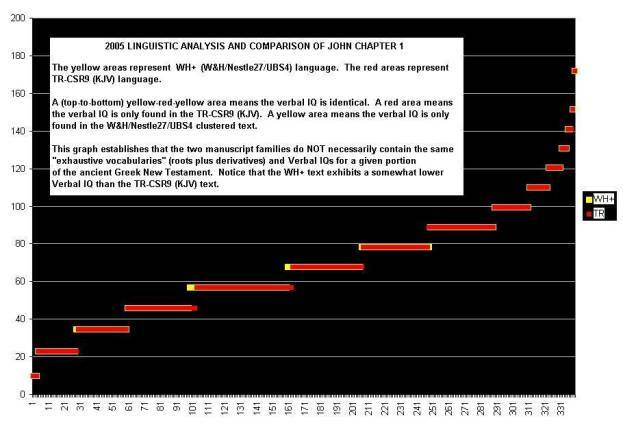 The TR-CSR9 text – the Textus Receptus CSR9/KJV Greek text – exhibits a somewhat higher Verbal IQ than the WH+ text – the Westcott&Hort/Nestle27/UBS4 “text cluster.” A text cluster takes a single text and adds the variants from certain, other texts. In this case, we started with the Westcott & Hort text and added the variants from Nestle 27 and UBS 4. Technical note: A fine, yellow, vertical line indicates a Verbal IQ region that is identical in both texts. The following graphic takes a couple of seconds to load.